The party decided they had chanced their luck enough with the strange undead creatures, and left them to sail off towards the islands that loomed ahead. The destination was an island – well, two island, rent asunder by a massive volcanic eruption. On the western face, the ragged sheer rocky volcano still fumed and billowed black smoke, and lava poured into the sea. One the eastern side, the island was thick with lush jungle vegetation. The more sharp-eyed party members caught glimpses of a structure perched between the tips of the the two island mountains, almost lost in the smoke form the volcano. It appeared to be a castle, with three main structures that were linked across the islands by bridges over lava and tumultuous sea. The guano contained the bones of mostly apes and demonic creatures, particularly vrocks, giving the party some clues about the local creatures. The party set off up the steep jungle towards the peak and the structure there. The castle came into view, a large austere stone structure, covered in lewd depictions of Demogorgon engaged in various acts of debauchery. The castle was also clearly damaged form the volcanic activity – a large hole demolished parts of the wall and roof, and appeared to allow the only access to the interior. A shimmering dome covered the castle, which Dacien deduced to be powerful artefact level magic – a planar abjuration similar to forbiddance, but also including some mind-compulsion enchantment effect he could not fully interpret. A small tower, built of skulls instead of bricks, lay just outside the field, and the party set out to investigate that first. The tower proved to be empty, save for filth and detritus littering the floor. The ceiling was pitch black, into which Mendel fired two arrows – only to be greeted by two large black puddings falling down towards him. Wary of the danger these things posed, the party threw their most powerful magic at them, only to disturb the rest of the pteranodon that was nesting atop the tower. This jumped down, scattering the party, and joined the battle – only to be attacked by the black pudding behind it. The party finally killed the beasts, and in searching the nest found a broom of flying made from coral and byssus, and an armoire of concealment. After resting up, the party decided to carefully approach the main castle – until Mendel blundered through the shimmering field. Mendel appeared unharmed but when eventually joined by the others, most of the party succumbed to a sympathy effect that caused them to believe this castle – now Demogorgon’s prison, was precisely where they were meant to be. Only Faldak, Gerald and Lenny remained unaffected. Undeterred, and in most cases spurred on, the party explored inside the castle. There was a large chasm splitting the main chamber in two, and a crude wall of debris and bodies piled the other side. To the west the party heard a cacophony of clashing, gnashing wailing and shrieking. The party flew over the chasm and the wall, and found some small buildings, containing maggots, worms, larvae (corrupted souls) and effigies of Demogorgon. A large stone statue of Demogorgon , much like the one they encountered on the Isle of Dread, patrolled the area, as did a band of vrocks that the party quickly dispatched. They kept the statue at bay, but whilst examining vrock bodies, a demonic female appeared and tried to assassinate Mendel. When her strike failed, she disappeared again, leaving the party on edge. The doors in the castle/prison were made from a metal mined on entropy-tainted planes, that carried and addictive poisonous sheen. The noise to the west came from several metal cages – over a hundred, teeming with prisoners of various breeds – mostly demonic. The party started talking to a quadrone modron, apparently an agent of Noumena (an immortal on the Council of Intrusion) desperate to report back. Before they could finish the discussions, a pack of Hezrou prison guards attacked. They party fended off the worst of the assault, but the rest retreated , wailing pathetically for their ‘boss’. The party teleported to Farshore and spoke with Manthalay and Lavinia. The settlement seemed to be doing well; growing beyond its previous walls, and some of the previous buildings torn down to make way for more warehouses. Ji's monastery had been completed, and Mendel's look-out post almost done. The party dined with Lavinia and spoke of the task to come - with the potential to end Vanthus' threat with some permanence. Lavinia gave them her blessing, her love for her brother long since dead. Zhedd bade his farewell to the party - his concern with the oncoming shadow pearl threat was more about the direct threat to the elven peoples than to Mystara itself, and so, should the party fail, he would see to it the elven nation of Wendar, and his Vyalia clan to the south, was secure. The party paid Lady Silvermane a visit in Sasserine. The Church of the Whirling Fury opened to them, and she greeted them eagerly. She had heard tell of the defeat of the Crimson Fleet from her agents around Ne'er-do-Well, and was eager to hear of progress. Agents of the Church were already mobilised, but their numbers few. She introduced the party to one agent - Lundgryn, a dwarven druid from Rockhome - as someone who could help the party on their next endeavours. 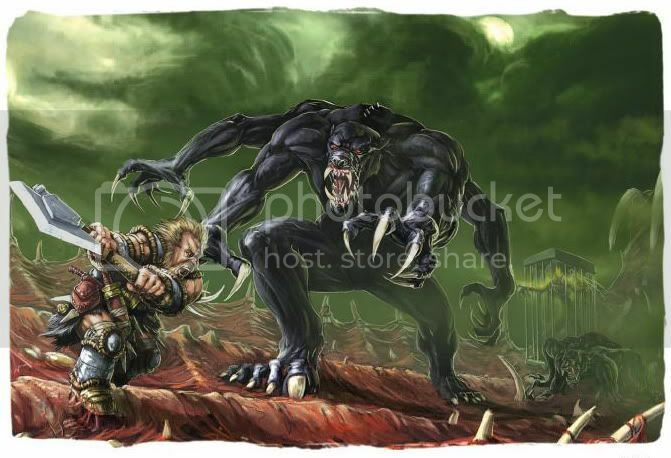 He had encountered Demogorgon activity in Rockhome and had heard tell that a band of ogres had stolen a Forge of Power there. The party sailed from Draco with the crew down to the Sead of Dread, to get the measure of the ship and its men. They were all hardened sailors and marines, but far outclassed by the party in terms of skill and abilities as adventurers. When the ship Intrepid was ready, the party affixed the wakeportal to the figurehead and set off. Dromedon, as ship's captain, could feel the pull from the magical artifact and set sail into the midst of the Sea of Dread. The sea around the ship started to churn and fume with sulphurous stench. Quick and stronger, then suddenly the party were pulled into the Astral. There, the ship's charts gave them a straight steer to the dark portal that led through to Gaping Maw. The Intrepid emerged into a roiling storm, waves crashing around them twice as high as the ship. Gerald quickly acted to calm the weather, and allowed the crew to wrest back control of the ship from the lashing winds. Several islands could be seen in the distance through the clouds, and the party headed to the nearest. The lookout spotted a strange form floating across the waves in the distance - less ship, more amorphous blob of congealed...something. A fiery light in a cage could be seen from afar atop this blob-ship, with two dark figures prowling its surface.They appeared to have not spotted the party, but Gerald's zone of calmed weather would soon intersect them. The party instructed the captain to intersect their course, and they were soon spotted. The dark figures teleported aboard the ship - dark unholy fiends, that stunned the crew with their hateful speech. The party sprang to their defence, Faldak taking a deep blow. The creatures fought viciously, but one was felled and turned into vapour as it died. The other teleported back to the other ship, as the vapour retreated in that direction too. The party mulled over what to next. The party spent much time in Sasserine planning their next steps and distributing or liquidating their loot. The chest proved a focus, and eventually the party realised that it was a fabled treasure itself - the Iron Chest of Dahnakriss, an infamous Master Thief and arcane trickster known to ply his trade in Thyatis and Karamiekos. To keep his ill-gotten gains safe, he devised a series of chests and lockers with intricate traps. This chest was guarded by each of the gargoyle faces, which could be manipulated into different expressions - in the right combination the chest would unlock. Antony set about trying combinations, based on the rhyme they found in Captain Wyther's bedstead. On the second attempt, the chest popped open, revealing further treasures of the fleet. These included another gem - the Heartstone, said to be an artifact that appeared at moments of selection of great leaders and something Dahnakriss had a penchant for stealing. Also present was the Wakeportal figurehead the captain had mentioned, wrapped in a cloth map that indicated the location of the various sea portals to the Astral Plane. The annotation on the map indicated it was from Greatrealm, a city in Hule. Preparations complete, the party teleported to Crossroads, and made their approach to report into the King Koryn. They were told to meet aboard the Maiden's Favour, a ship moored in the harbour. There, the king met them with a lobster dinner, and questioned them about the outcome of their efforts to bring some element of control and stability to the civil war-strewn city of Scuttlecove. The king wasn't overly happy with certain aspects - that his former friend Kedward had been feebleminded and handed over as a slave, that a follower of Talitha was now the most potent force in the city; but through Gerald's clever diplomacy they were able to convince him of the necessity of the outcome as it was, and that they may return to deal with some of the outstanding issues now the Crimson Fleet was defeated. They also made a gift of the Iron Chest, which was enough for the King to make good on his promise of favours and rewards. The news about the shadow pearls troubled the King and he agreed to make an introduction to the Emperor of Alphatia, Heldeberan No-Man's-Fool. In the fortnight it took to arrange the meeting, the party stayed over in Sasserine and indulged in shopping. During the stay, Zhedd noticed one night when the animal life around the tailors seemed to disappear, and Antony spotted a bat in the eaves opposite seeming to watch the goings on in the property. It detected as a powerful undead, but when approached it fled. The next day, Mendel and Dacien paid a visit to the Witchwadens to question them about the event. They were met by a stand offish Her Dark Priestess Annah Teranaki, who did little to answer their questions and went to lengths to point out that sentient undead should be able to do as they please like any living person. As they left, however, she did ask Dacien "How did he find Scuttlecove?". The party travelled to Sundsvall, capital of Alphatia, to meet the Emperor, joined by a priest of Koryis as his advisor. He welcomed the party and thanked them for their efforts in bringing the shadow pearl problem to light. He agreed to make approaches to leaders of other nations to alert them, but felt this needed to be handled delicately - to avoid panic and mistrust. Key would be to find the Master Pearl and deal with the problem at its source. He offered the party a ship in order to make use of the Wakeportal, should they wish. He also offered up the resources of the capital's libraries for further research into Demogorgon, Gaping Maw, the gemstones, Arik, and other problems the party happened to be keeping under their hats. 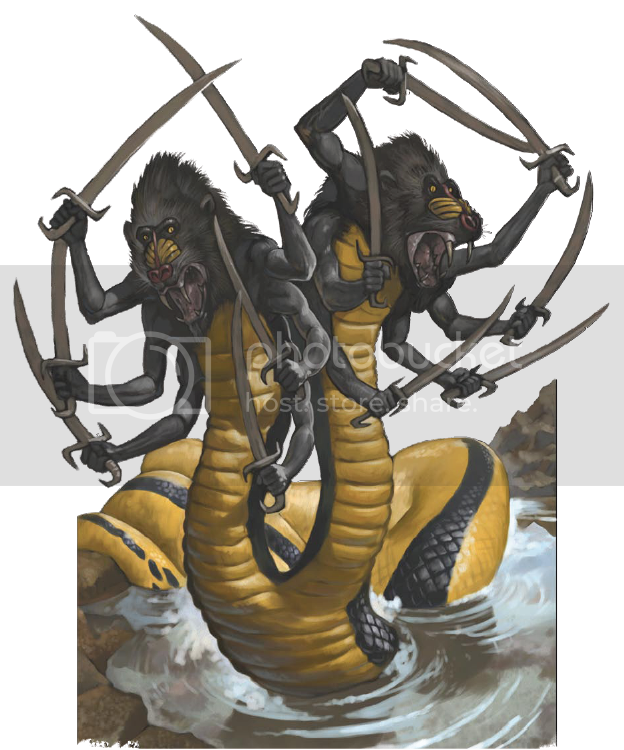 Demogorgon's heads, Aameul (the left head) and Hethradiah (the right head), have different conflicting view and attitudes - one cold and calculating, the other ferocious and savage. Mid-teleport astral indecision led to the party arriving in Crossroads, capital of Ne'er-do-well, a better place for shopping and for Felix to report back and retire from the party. Felix bade the party farewell, heading back to report to King Koryn on the progress now that the Crimson Fleet had been routed. 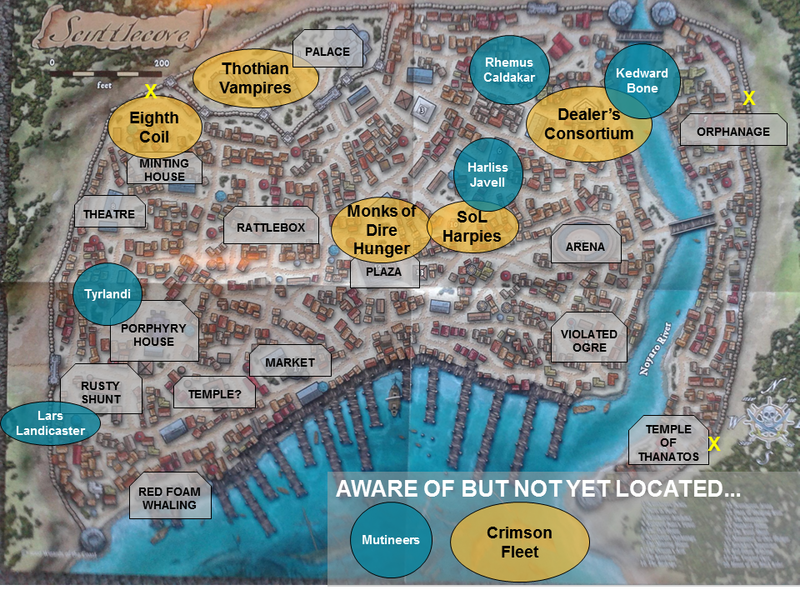 The party stayed in the quarters at the Temple of Asterius under the eye of the cleric Articulate, whilst they stocked up on spells and equipment to better face the yagnaloth in the pirates treasury. The next day, the party teleported back to the Wreck. There was no sign of other activity, just the growing stench of bodies, but the stagnant water seemed thicker with glistening green algae. Mendel spotted movement in one of the gibbets; a horribly disfigured red-skinned pirate, bird-like mutations warping his body and face. He was clearly in pain and Mendel put an end to his misery. Dacien has arcane locked the treasury door, so readied to open this with a knock for Antony to slip in under Zhedd's greater invisibility. The yagnaloth had moved all the chests to the far corner of the room so not to be visible from the door, and was waiting poised for someone to enter. Antony snuck into position for a backstab, as Faldak and Mendel enter - both succumbing to the forbiddance effect in the chamber. Both were stunned by the creature, and Mendel was dragged into the chamber. Fortunately, his stunning wore off quickly and he was able to flank the creature, allowing Antony to finish it off with a couple of well-placed strikes. The treasure hoard was theirs, the largest of their adventuring career so far, and more coins than they could count. They secured what they could, but were left puzzled by a large ornate chest decorated with seven gargoyle faces. The party did not recognise this, and as Antony detected each face carried a trap, they left it be for now. They set about clearing the rest of the base, starting with the ship below - the Black Sprite. This seemed to be the Fleet's war-room and operations - rooms filled with books and maps, charts etc (see below). They also found a shrine - a scrimshaw statue of Demogorgon leering over a doorway. In its tentacles floated an orb, an intricate puzzle box. After a couple of failed attempts that almost severed his fingers, Antony managed to open the orb. The room filled with a narcotic gas, Faldak's dwarven constitution failing him, as the statue seemed to come to life. Antony's mind was flooded with the knowledge that he was no directly communing with Demogorgon. He asked tentative yes/no questions - Is Vanthus on Gaping Maw (Yes)? Is there a master pearl (Yes)? but the intrusion into Demogorgon's psyche was too much and she noticed. With a sibilant sneer, the statue exploded, ripping a hole in the side of the ship. Dacien has a feather fall spell ready, and the party started floating to the deck below - on which waited the demonic retriever. Faldak was hit by a petrification ray, and plummeted onto the golem. Mendel peppered it with stonebreaker acid and arrows from above, as Dacien returned Faldak to his fleshy beardy self. Quick to regain his senses, Faldak started lopping off legs from the creature, bringing it tumbling down around him. Antony found a symbol of insanity and was briefly mobidly fear of the sea before Gerald could cure him. This ship held a galley and a gaol - in which the party found an elven woman's body, and a comatose red-skinned pirate with a badly broken jaw. They restored the pirate, who introduced himself as Ratline Sid from Torreon, one of the mutineers that Cold Captain Wyther had captured and tortured for more information about the mutineers. He confirmed what the party had heard - Vanthus had returned and humiliated the captain in front of his fleet. This sparked a mutiny amongst the already disgruntled captains - unhappy at plying trade under the yoke of Hule, so far from their home on the Savage Baronies, and now being driven by Demogorgon's clergy. Sid was sad to hear of the death of Harliss, and keen to escape and rejoin with the fleet mutineers. The party agreed to bring him with them for now and kept a close eye on them. Sid explained that the creature kept in the front stone hut was a dark beast bound there by Wyther, who could move the pontoon from afar to allow ships in. The party decided to keep clear - more on the basis it was unlikely to have any treasure. They found a shrine to Demogorgon in another hut, with a dark tapestry depicting slaughter in the beasts name, and an altar covered in candles; two black waxy stains now empty. Giving the base the final once over, Zhedd spotted a movement in the water. Two large crocodiles were sent down after it, but didn't return - a muffled flash was visible under the murky pond scum. An eye appeared above the water to the side, and Dacien lowered water to reveal an eye of the deep. Faldak and Mendel drew their bows but both succumbed to its blinding flash and eye rays almost as quickly as Gerald could heal them. Eventually it was defeated, and the party found its treasure hidden behind an illusionary floor in a nearby hovel. The battle restarted as Mendel picked off some of the pirates. The other pirates gathered around Cold Captain Wyther and whisked him away with a dimension door. Some of the pirates went invisible and snuck forward, whilst others, upon red-skinned leathery wings, took to the air and tried to magically ensorcell Faldak and Felix. Commands in abyssal could be heard from below, again ordering some candles to be lit. The rest of the party joined the battle against the pirates remaining on the top deck; smokestick arrows countering their invisibility, and allowing the others to attack. The pirates soon realised they were beaten and began to flee - just as two arrow demons appeared at the side of the deck, and started peppering the party from afar. The remaining harpy from the previous encounters also appeared and sand a song of confusion at the party. The party was momentarily in disarray as Antony turned on Mendel who promptly fled, before Zhedd used his solid fog spell to remove temporarily the arrow demons from play, and Felix countersang the confusion effect giving Dacien time to capture the harpy in a resilient sphere. On the deck below, Faldak had been leading Felix in a slaughter of the pirates gathered there. The slavering dwarf cut so many down they decided to flee, leaving a deck covered in gore. Felix found a trapdoor heading down, and they decided to explore - not before Dacien paraded Wyther's body for the base to see, and Felix called out for any remaining to flee. Mendel and Faldak picked off fleeing pirates from afar, as Dacien raised the water level to stop them using the skiffs to escape. Once people were healed, they headed below decks through the trapdoor. A trap below drained the life energies from Antony, Mendel and Faldak. A small anteroom led to another chamber with lead-lined walls that shimmered with magic. Crates and sacks of treasure were visible, but as Antony peered around the corner, he saw a large demonic creature, one arm massively oversized, waiting to pounce. A brief spell of combat left Faldak stunned, and Mendel heavily injured; and the party in disarray as Gerald's holy word backfired on them. Felix joined the party and tried to talk to the yagnoloth, who mentioned only that he was working for Demogorgon. Gerald managed to pause the combat with a magic circle vs evil and the party tried to negotiate; offering to free the beast. He said he knew of a means in the base to free him, but wanted healing first. When the party offered only a potion of cure moderate wounds, he wasn't impressed, and grew irritated and insulted at Mendel's tone, and refused to cooperate. Relived that the combat had stopped, a bloodied party quickly teleported to Fort Gerard to recover. A sullen fishing crew docked into the harbour at Crossroads, shaken by their wounds. The party offered to ensure they were healed, Mendel looking to buy their silence. Wetherby tersely agreed, and they accompanied the party to the Temple of Asterius in the city, The temple was in the design of an open market, and they were greeted by an unkempt man in rags, who introduced himself as Articulate, the high priest. He agreed to offer the men lodging and would consecrate the pool in the rear garden in the morning so that healing magic could penetrate and cleanse the vile wounds. 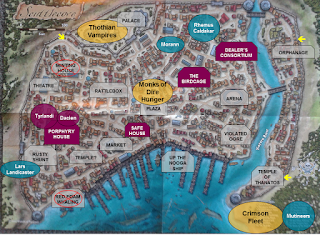 Dacien, looking to make amends to the fishermen, set up his mansion and invited them to stay and enjoy the refreshments.The next day, after healing, shopping and several breakfasts, the party set about planning heir assault on the pirate base. There was much debate about using the explosives they picked up from the assault on the Temple of the Frog coupled with Mendel's ballista as a long-range delivery system. but too much debate led to them resigning to just teleporting into the top of the stack of ships they had spotted and making their stand there. Next morning, they did just that - Dacien and Zhedd taking the party in two teams. They arrived on the uppermost deck, faced by the two remaining harpies. In a reinforced crows nest above them stood a female pirate behind a ballista. Across a walkway, nested in another tree, there waited a large mutated, aranae, green pustules glistening on its carapace, and each of its feet ending in another quivering spider body. Silence spells and arrows quickly nullified the harpies, who flew off to try and rouse the camp - calling out to "light the candles, bring help!". The pirate fired a magical ballista bolt into Dacien, which spewed acid around him like a fountain. The large aranae . closed to engage Mendel and Faldak in melee, seemingly resistant to a lot of their attacks. Antony, Harliss and Jerome climbed into the crows nest to tackle the pirate. The trio made short work of her, but not before she had ensorcelled Jerome into attacking Anthony. Felix used his glitterdust to keep the enemy from going invisible, and flew to the other side of the aranae to flank it. Shortly, the base started to come on alert. Cold Captain Wyther flew up on one side of the ship, whilst the multilimbed demon appeared the other. Wyther waited, biding his time, until goading Harliss into firing the ballista at him. He caught the bolt with barely a blink, and with a crimson streak, suddenly appeared at he side and plunged his sword up between her ribs. Critically wounding her, she died instantly. Noticing the red liquid-containing medallion at his neck glowing when he travelled, Mendel carefully aimed an arrow at the chain, and nicked it enough to cause it to fall to his feet. Fearing the bow, the demon demanded Mendel throw his weapons over the side of the ship. His sunblade disappeared into the water, leaving Anthony to recover it, Jerome hot on his heels. The aranae realised he was loosing his battle, instilled a psionic aversion in Felix and Faldak against spiderkind, and called out to Wyther in the abyssal tongue that he was abandoning the pirate to his fate. As it retreated, Zhedd summoned an air elemental to track it. The elemental, with a stroke of luck, managed to grapple it from the walkway - causing it to fall to the ground and die. Dacien sensed that the leaping demons were about to teleport o nto the deck, and called over to Gerald. Gerald used his holy word to banish the large demon, and then again to banish or stun the leaping demons as they appeared. Growing worried, Wyther tried to charm the party, but was caught out by Dacien's spell turning. Mendle found himself friends with Wyther - but also Wyther with Dacien. Dacien called out to Wyther to call a halt to the fighting, and they agreed to parley. The captain also agreed to show Dacien a list of cities that the shadow pearls had been sent to. 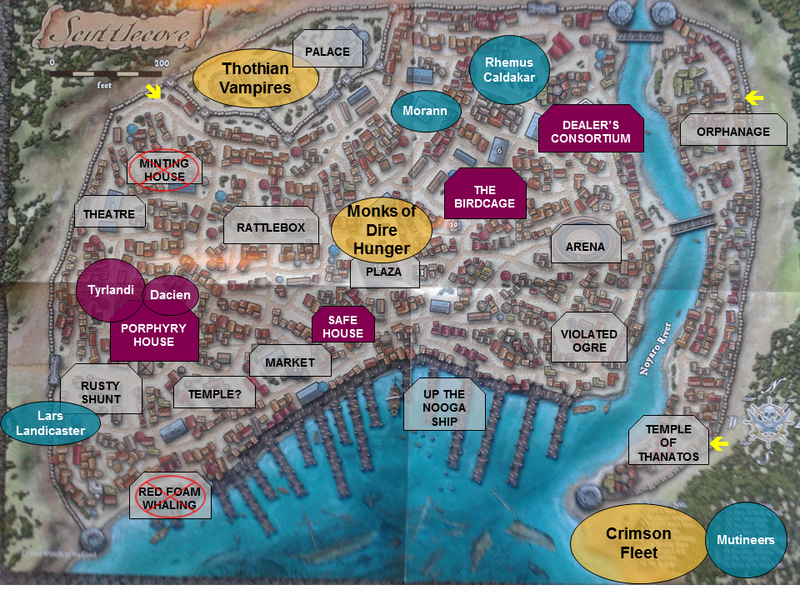 Not all the cities on the list had received them, after the party stopped their production on the Isle of Dread. Wyther revealed that he was currently recruiting/press-ganging a new pirate force after Vanthus had humiliated him in battle and stolen his ship - leading to a mutiny amongst his crew. Vanthus had returned from the dead a death knight, an undead warrior. Wyther seemed more bitter that Demogorgon had given Vanthus her blessing and favour rather than him. 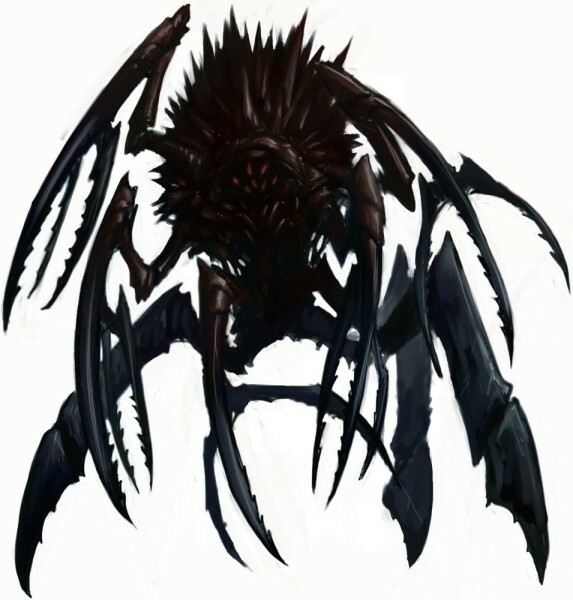 If the party were going after Vanthus, Wyther would let them leave with his blessing - they could find the wretch on a pleasure-palace-turned-prison called Divided's Ire, on Gaping Maw, a demiplane created by Demogorgon. Vathus has stolen the captain's ship and something called a wakeportal to get there. He had another he could sell the party if they wished. The party reconvened in the Dealer's Consortium, with Tyrlandi taking stock of her new domain and going through Kedward's paperwork. She asked the party if they had found Kedward's stash of treasure, and then coyly offered a race to find it. The party spent some time examining the interior but found no sign of secret doors. Outside, Mendel and Faldak examined the outside - eventually spotting the construction was such to accommodate a hole in the foundation. Antony spoke with thin figure lurking in the shadows - who turned out to be a former agent of Kedward's and eager to be a key contact for the new boss. Eventually, they spotted a disturbance in the structure, which they surmised to be a elemental or ethereal creature moving about the brickwork. Inside the building, Zhedd summoned some earth elementals and sent them below in search of a chamber whilst Faldak set about being a good dwarf, and took to digging a hole in the floor. After the elementals failed to return, a second foray was sent and reported back that spiky skinned fiends were present in a chamber some 40ft below, with a dark aura that mad them feel unwelcome. Tyrlandi emerged from the upper floor, and angrily berated the party for damaging 'her' building. She then revealed that she had located the chamber and Kedward's treasures, and the demons were now under her control. Mendel seemed to set about berating and provoking her, which she did not take well to, and said he would no longer be welcome. The party then sent some time planning how to get a boat or ship form the Scuttlecove harbour to use in their reconnaissance of the pirate base. Several ships seemed suitable,including Jerome's Up the Nooga, but the problem was to how to escape the maze of scuttled ships in the harbour without arousing suspicion. Then, it suddenly struck the party that Scuttlecove wasn't the only city nearby - on the main island Ne'er-do-Well, the city Crossroads where they met King Koryn could also be a safer place to set out from. 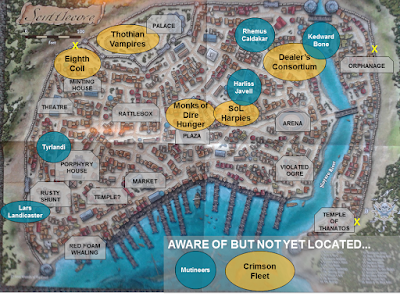 Dacien teleported them there, and they spent a few days planning, shopping and spell-scribing there. Antony found a local fisherman named Wetherby, who was persuaded to take them out in a dogger he used for trawling in the seas east of Lesser Ne'er-do-Well. Wetherby took them out at dawn, and with a good wind at their back they made good time through the straits. Jerome pointed out the arched stone marker, and there, a half-mile off shore, Wetherby dropped a sea anchor. Most of the party managed to pierce the illusions protecting the pirate base - visible to them as a small scattering of huts around a tower in the midst of a wide saltmarsh. The party, using seeming, set about pretending to be fishermen, whilst Zhedd, invisible and in the guise of a seabird, let for a more detailed reconnoitre. He spent quite some time examining the base, seeing several dishevelled red-skinned figures in gibbets scattered about the base. Occasionally, pirates would emerge from the huts and stroll around swollen, squeaking walkways, on guard or latrine duty. The most remarkable feature was a trio of large petrified trees to the rear of the base, with five ships of various sizes impossibly hanging in their midst. They were connected by rope ladders and rope bridges (string in the picture), and a few pirates were on the decks. Ballistae were visible on the uppermost ship, and at the base, a large elephant-like spider demon stood guard. The creatures resistances made it a slow battle, but it focussed its many attacks on Mendel in fear of the sun blade he carried. It's scimitars and piercing gaze seemed to carry a supernatural damage that drained the party to their core, and the fishing crew too - the party were to later calculate that this damage would need to be treated in specially consecrated areas into order to be healed. Eventually, the creature sought to escape, and dove into the water, desperately trying to dispel the dimensional anchor Dacien had placed up on it. The party limped back to Crossroads to recover and plan. The party decided to take up the ruse of selling Rhemus the aranea body parts as an excuse for meeting with the gnome. His dark stone premises near the north gate were covered in skulls and bones - Dacien recognised at least one bone golem hidden amongst the grisly decor. What appeared to be a flesh golem greeted the party at the door, and Felix quickly sketch out a calling card, portraying the party as purveyors of post-mortem pieces. Rhemus later welcomed them in and they discussed business for a short time, hearing of Rhemus' work and interest in the provenance of the body parts; features of the donor creature could impart unique properties, and he told the story of using the hands of a paladin on a flesh golem for a client in Karameikos. With a rapport built of a potential steady supply of creature parts, talk came around to favours that Rhemus could offer the party - namely an introduction to Kedward Bone. Warily, Rhemus brought up that he could make an introduction, especially using Mendel's Zzonga sample to entice the drug dealer, but was more interested in what the party could do for him. He mentioned Matylda, Kedward's familiar, was in love with him, and he needed a skilled team who could get her away from Kedward's person and bring Matylda to him. The catch was, Kedward would have to be alive to achieve this, or his bond to the familiar would be lost. In return, the party could claim a large emerald Kedward kept in his chambers. 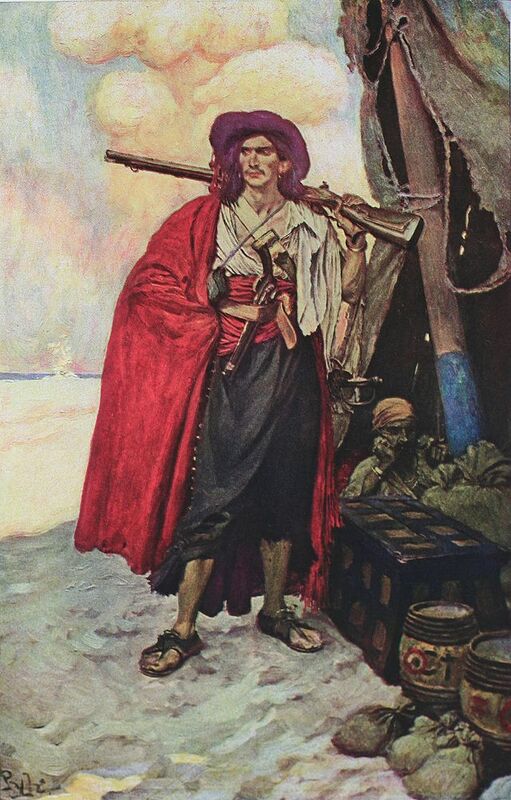 Rhemus also explained how Kedward contracted a strange disease on his travels as a pirate and had become a recluse since, possibly linked to the emerald. The party agreed on a course of action, taking on Rhemus' advice that Kedward liked a bit of rough and tumble and could be enticed into melee.. Before they left, Mendel damaged relations with Rhemus by placing part of the Gakarak wood he obtained from Emerond on to the table - which turned out to be a golem carved from treant wood. the plank was absorbed into the table and Rhemus was unhappy at the potential complication this might cause. The battle became more fraught as two barbed fiends joined the fray and a wall of force bisected the room and left Mendel exposed. Felix leapt out a window to skirt around the outside of the building. Kedward and Mendel faced off in melee. Gerald's quick thinking managed to heal Mendel just in time before Kedward cut him down. Faldak fled to safety, taking the covered pedestal with him. Meanwhile, Dacien had proposed to Tyrlandi, who spotted an opportunity that was unlikely to come up again, and agreed - sealing it with a blood oath. She joined him on the return to Kedward's, ready to join in the take over of the Dealer's Consortium. She quickly earned her place, dissolving the mummy with a well timed heal. Mendel bought enough time for Felix to crash through the window and finish Kedward with a rapier through the spleen. The party left the fleeing arenae sorcerors and hurried to the basement door. Mendel bellowed a few stark words of warning to intimidate any remaining pirates as Dacien released his arcane lock and the party headed down the rickety stairs. The basement was deserted however, as the elven party members secret doors that Faldak confirmed a group of at least ten had fled through. The basement contained a small forge for melting metal down, coins skimming and stamping - Mendel promptly swept the tools into his bag. They also found a jail cell holding a red skinned pirate, with a strange scaly crab-like claw for a right hand. He was unconscious, badly beaten, and in some distress, so the part patched him up and carried him along. They also found a hidden shrine to Demogorgon, with a grotesque statue leering at them as they emerged through the secret door. Amongst the pirate belongings they found a silk bag with a bird embroidered on its front. 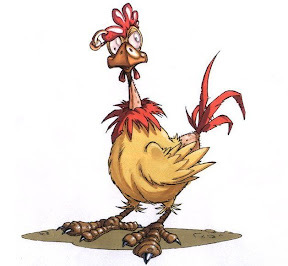 each time the party put their hand in a yellow canary emerged and fluttered about their heads. They decided to keep this away from Felix for now. Questioning the captives, it appeared the human knew little of the existence of aranae in the Minting House. The aranae captive was more sullen and offered little more of use. It seemed the coin-skimmers Dacien trapped in the basement had fled through a hidden underground passage, full with sulphurous fumes. The narrow passage seemed a natural fissure, a rarely used escape tunnel. This lead to a trap door in the ceiling, which opened up into an abandoned butchers shop, where a band or aranae and forgers waited in ambush. After a bit of a fraught battle, the party captured two rogues who found themselves hidden and invisible behind Dacien's wall of force. They gave in to questioning but knew little else of importance, seemingly dupes in the aranae's plan. The party stripped them of their belongings and sent them back to their lives as forgers, neglecting to mention they'd taken all of their equipment and their livelihood. The party made their way through town, not spotting the cache of magical weapons hidden in the bottom of a traders wheelbarrow, and leaving a squabble between a priest of Thanatos and the gnomish golem maker over a body lying in the gutter. Dacien picked a spot to erect his magnificent mansion as a base of operations for the party. The party entered and explored their new home, other than the host's spacious locked quarters, and shut their prisoners away. After an expansive banquet, Harliss was scryed and found in the Rattlebox, gambling and drunk, so Felix and Antony went to retrieve her. 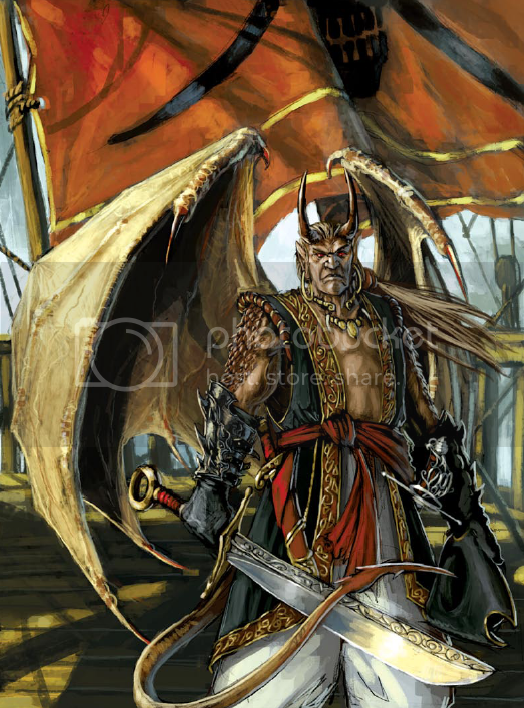 The red skinned prisoner called himself Jerome LeShiv, with a brother Longshanks also in the fleeet, He was weak, and ravaged by the 'red curse' the party had seen afflict the pirates of the Sea Reavers in the Crimson Fleet. His right hand was becoming increasingly crablike. He begged for cinnabryl jewellery, so Anthony handed some over, and it seemed to ease his condition from worsening. He then explained he was also a mutineer from the Fleet (Harliss vouched for him), and stopped in town before making his way home. He mutinied when Cold Captain Wyther was humiliated in front of his (already unsettled) men - by captain Vanthus returning, now a changed dark creature, and beating him into submission and stealing his ship. His ship 'Up the Nooga' was in port. The Eighth Coil captured him for Cold Captain Wyther and were due to take him back. 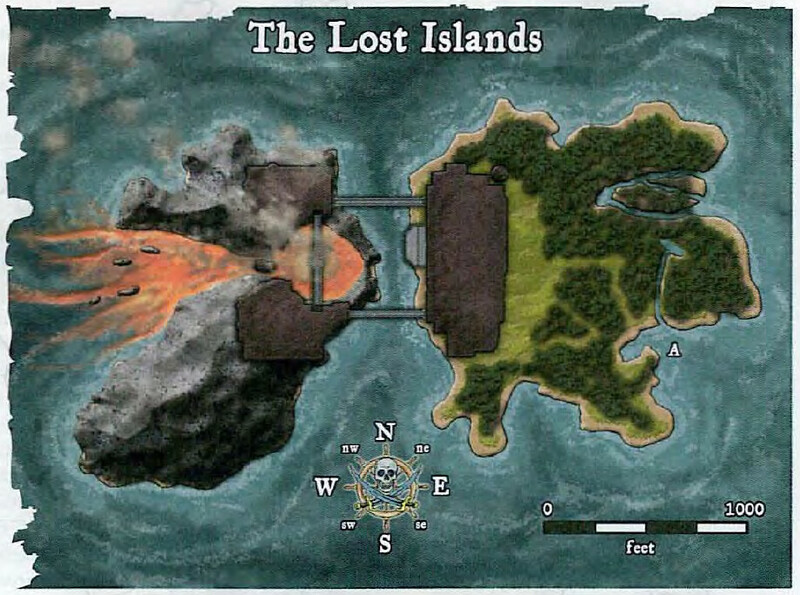 He described the pirate base and its location - 'The Wreck' as it was known is hidden on the north west shore by powerful illusions and magicks that block teleportation. The base was a collection of outbuildings around a strange structure - a series of captured prize ships stacked in a column around a large tree trunk. There were maybe 40-50 pirates still in the base and loyal to the captain, who also had some 'monsters' he kept hidden and at his disposal. One was a demonic creature that his in a hut near the entrance that used telekinesis to move a boom from the harbour entrance. Jerome and Harliss were willing to help the party in their assault on the Wreck. A small group went to check on Jerome's ship which they found abandoned in port. However they were followed back by an invisible aranea who tried to stop them as they re-entered the mansion.This drew a crowd who raised an alarm. Knowing the party would be in trouble leaving the mansion if they waited too long, they resolved to leave as soon as possible. A leaping demon was waiting outside for them, with the aranea. Dacien tried to leave a trap for them as a delayed blast fireball but the aranea caught the party in a web around the deadly gem. Not realising the significance of the gem, Felix tried to burn the web away from the trapped party with a potion of fiery breath - which triggered the fireball and engulfed the party. With several members barely alive, they party limped away and hid at Red Foam Whaling. hoping they would not be found. The next morning, Mendel convinced the others to visit Rhemus Caldakar, the golem maker, as a source of potential aid against the pirates. In their hovel, the party further questioned Harliss and discussed what to do next. When talk turned to paying a visit to Tyrlandi, Mendel felt the presence in his mind again as Tyrlandi spoke to him through her greater scrying spell. She informed the party that she had a visit from both the monks and the harpies, looking to cement alliances and unite against the parties efforts in the town - and wondered what had happened next. She did not respond to any further questions. The city was still bustling an on alert, so, fearing reprisals, the party set to sneak out of the city. They went in the direction of the north gate, but saw a swarm of thugs and leaping demons, so veered across the river. They scanned the eastern perimeter wall for possible exits, and found a gang of street kids gathered round a makeshift exit. Throwing a liberal amount of copper coins in their direction, the party left through the wall and stayed overnight in the shrubland outside using Dacien's rope trick. The next day, the party looked for another way back into the city. Heading south, they found a path leading from a hatch in the wall toward the rocky shoreline. There, they spotted several bloated corpses, mostly human, but some animal too. The party examined the bodies from afar and saw signs of surgery on the discoloured cadavers - but unwilling to get too close, they left well alone. Antony snuck through the hatch at the wall and past a priest that was sweeping grime and gore away from the back of a dark stone building and cellar hatch. He passed by and circled round to the front of the building. Two guards with rheumy eyes and blackened eyelids stood staring out to the harbour - around their necks hung black scythe and skull pendants, dark symbols of Thanatos, the entropic Grim Reaper. Antony engaged them in small talk and found out they were waiting for the infirm and injured to be brought to them by those in the city, and were willing to pay for the privilege. Heading back, Antony caught the eye of the priest on cleaning duties and found out that, for a bribe, he was willing to bring out belongings from the bodies that were brought to the temple. 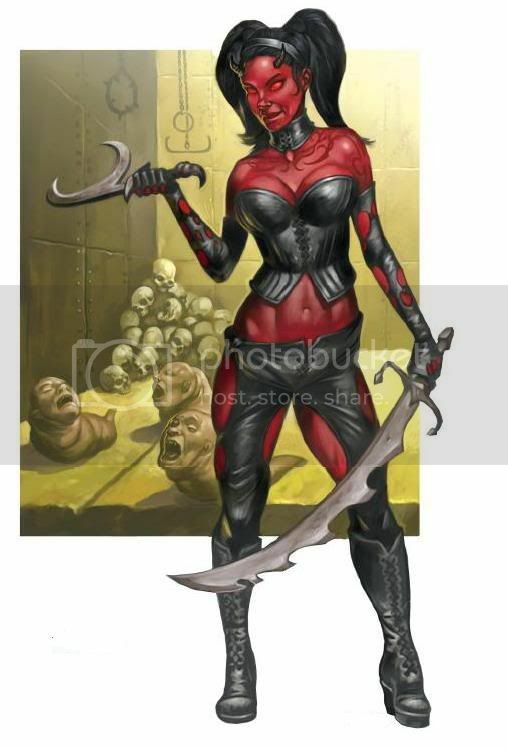 Hearing that a pirate of the Crimson Fleet was brought in recently, and wanting a diversion to allow the party to enter, he made the transaction, and acquired a cinnabryl bracelet for Harliss to use. In the city, the party dodged several patrols to make their way to Porphyry House to speak with Tyrlandi. Her guard, a burly human, and her madam, a gnomish woman, led the party up a secret flight of stairs to the top floor. Tyrlandi, the beautiful exotic woman, was sprawled on a chaise-longe, sucking on lollipop as she waited for them. Her heritage seemed to be part nymph but tainted by entropic fiendish blood. The faint sound of a child crying could be heard. The party recognised the symbol at her neck as that of Talitha, the Queen of Treachery. Tyrlandi greeted them curiously, eager to learn about their aims in the city and seeking to get information from them about their various goals and the information they had learnt about the palace. She answered the parties questions, but demanded locks of hair in return, gaining them from Felix, Antony and Mendel. She explained that she wanted to rule the city, unrivalled, and saw Kedward as her biggest rival once the Crimson Fleet were dealt with. She wanted the harpies in her pocket too. 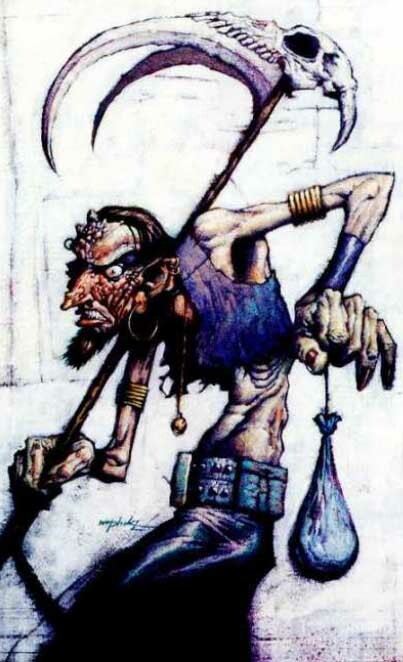 She did share information with the party if they chose to go after Kedward - that Rhemus Caldakar, his gnomish travelling companion of old who was now running a golem making business, was friends on the surface but secretly desired Kedward's imp familiar Matylda, and was plotting to kidnap her. Kedward was also a diabolist and could call upon demons to aid him. 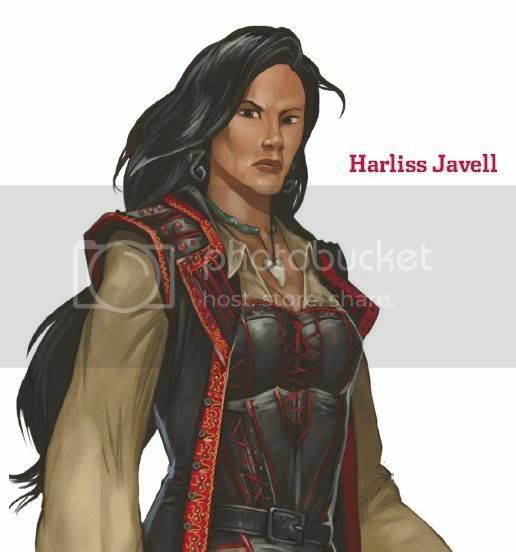 She also let the party know that the Eighth Coil wer einfiltrated by araenae, and we paying the harpies to torture and interrogate Harliss - but she had been intercepting the payments to try and keep Harliss alive. The party left with their information and set about taking on the eighth coil hideout. They tried to sneak round the back of the building but were spotted and a prolonged spellcasting battle ensued, involving pirate thugs and araene sorcerers. Fireballs and lightning bolts rattled the building as the party drove into the ranks, locking several others in the basement. In the end, several aranae escaped via fly, but the party did have one unconscious foe alive for interrogation.